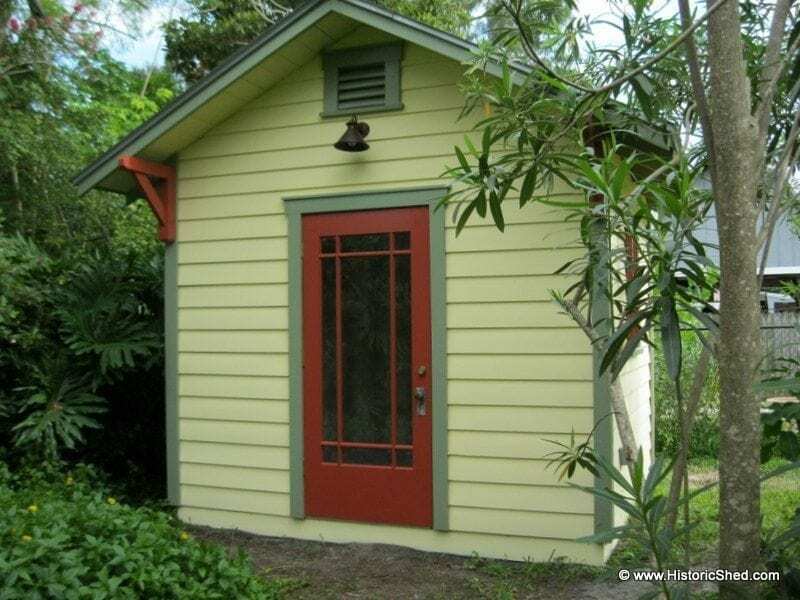 A recent Historic Shed project was designed for the owner to use as a watercolor painting studio. At 10’x10′, the shed did not require a building permit in the City of St. Petersburg. 10’x10′ gable shed with a finished interior for use as an artists studio. The studio shed incorporates a door that the owner had saved from the main house many years before. Termites has done extensive damage to the bottom of the door, which we trimmed down and patched. A salvaged mission style wood door makes a nice focal point on the shed facade. Salvaged wood windows are located on both sides of the shed to capture cross-breezes. The interior was finished out with drywall and a tiny wall AC unit will keep the studio comfortable in summer months. The shed complements a 1920s bungalow that the owners have lived in for over 30 years. Is your place for sale? Not sure which you are referring to. Our company location is not for sale, but all our sheds are.